The life on earth started from caves, man made progress evolutionary. Among all the hearth of urbanization: Indus valley, Euphrates valley, Yellow Rivers’ valley, and Mesomerica, one thing was common which was man’s fight against nature and hunger. In this connection, man has invented hundreds of tools and machines. As cave’s man man developed early hunting tools, similarly man in the urban’s hearth pioneered in agriculture and human settlement. In this connection, natural calamities and hunger acted as an catalyst for human struggle. 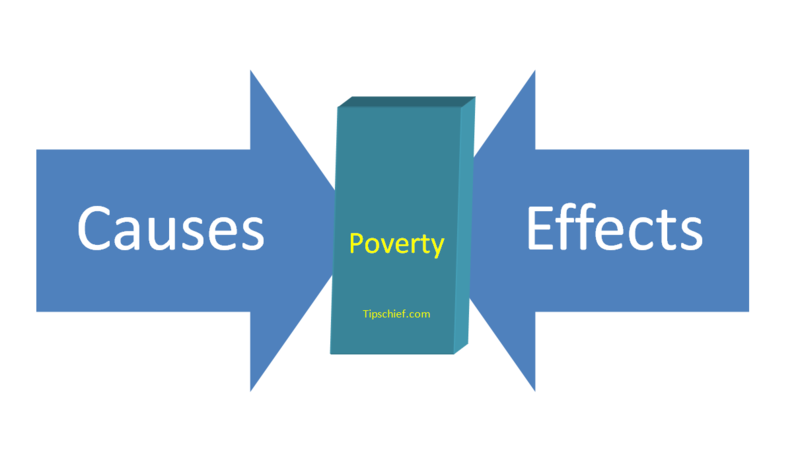 (The causes effect and remedies for poverty is available in pdf format click at link to get pdf copy) The causes effect and remedies for poverty However, as human population grew the stress on human resources also increase. Due to this pressure, the world resources become scarce at some places, while in other regions abound in resources. Unlikely, this thing creates uneven division of resources and as well as uneven development. Consequently, countries rich in natural resources make progress by using their abundant resources, while countries having a lack of resources are still fighting to eliminate their hunger. Moreover, the situation has become worst due to war, terrorism and a power play by the big powers. Thus, lack of political will to eliminate hunger, uneven distribution of resources and development, and climate change are adding more poor by every passing day that are the main causes of poverty. On the other hand, more specifically poverty can be categorized as Relative and Absolute poverty. Relative poverty is comparison of richness of two regions’ population, while absolute poverty is availability of same resources for longer period. 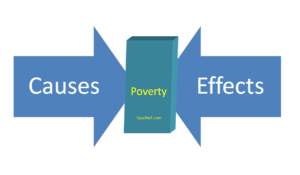 There are numerous causes of poverty. However, it has two broad categories, one is natural cause and another is due to other human activities and policies. The climate change is one of the biggest natural causes of poverty. On the other hand, failing economies, overpopulation, lack of educational and health facilities, poor infrastructure, poor management of resources, wars and conflicts, terrorism, and corruption are major ingredients of poverty. Due to global warming- Essay on Global Warming – climate of the earth is on change. Therefore, average temperature of earth is increasing. As a result weather has become uncertain in various parts of the world. Some regions are facing high ratio of rain while others are having no or little rain. Moreover, increase in temperature has increased the rate of melting rate of glaciers. Thus floods and scarcity of water are going side by side in different regions. Due to this agriculture production has been falling. Although high yield technology is so far meeting the food need of the world, yet voices are coming for shortage of food in various parts of the world. For example, in Asian countries Pakistan is facing the adverse effects of climate change. According to UNO Pakistan is in the list of the most vulnerable countries to climate change. Pakistan’s population is already facing scarcity of food and water. Being an agriculture country Pakistan has to import wheat and vegetables on numerous occasion. Moreover, in African countries like Ethiopia, Sudan drought has taken life of hundreds. Thus climate change primarily adds more poor to world population. Likewise, downfall in economy forces a country to make poor unfriendly decisions. Moreover, the poor economies can not produce more jobs. Due to high inflation rate unemployed and poor people found themselves in distress to meet their needs. Unemployment rate ranges from 2.4 % to 29% in EU, while it is high in Asia and Africa. However, the situation is better in developed nations as unemployed persons are given monthly incentives but in developing countries no such incentives can be made due to lack of capital. Moreover, a major share of GDP of former nations went of debt serving which they have obtained from IMF. Thus little money is left behind to eliminate hunger and to raise standard of living of people. Similarly overpopulation is also a major cause of poverty. Increase in population means increase of pressure on available resources. When demands for commodity increase on contrary to their production, it consequently creates shortage of commodity. Moreover, increasing demands increase inflation. Thus people can not purchase such item. In addition to this illiteracy is another dilemma of the poor. At present well educated and skilled people are struggling to get jobs. Likewise, governments work for creating jobs for educated masses. The role of education is important in economic development-read-Contribution of education to economic development.Therefore an illiterate person in the system becomes futile. Thus such people have to fight day and night to earn their livelihood. The major cause of development of the west is education, and a lack of which is also a great cause of poverty for eastern nations. Moreover, being sick not being able to see a doctor is considered as poverty. Epidemic diseases like AIDS and Malaria are causing deaths for people not having health facilities. According to UNO more than 3 million people have been died during the last decade in Africa due to AIDS. While AIDS is also a threat for China and as well as India. On the other hand poor management and poor infrastructure also increment poverty. At one time Pakistan was rich in water resources, but due to climate change and poor planning to manage the resources it is now facing scarcity of water. Example of Nepal can be quoted for managing water resources and making adequate measures to stop flooding. So it doe snot matter a weak economy cannot do good. Good management and timely actions of government can make a difference. Wars, conflicts, and terrorism not only destroyed available resources, but it also cuts the supply of resources from other regions. Thus the majority of the population stricken by drought and hunger. In the middle east, Syria and Africa majority of the population is living below the poverty line due to war. On the whole poverty affects living standards of the people. Due to poverty people can not find shelter and food. Neither necessity of life, nor resources are available for poor. Poverty breeds corruption and crimes. Poor masses forget manners and ethics to fulfill their desires. Moreover, poverty brings hunger. A poor and hungry person is a good tool to be used by terrorist. Thus a major social and cultural issues are linked directly or indirectly with poverty. There may be short-term and long-term policies to eliminate poverty and hunger. According to UNDG education and even distribution of resources can end poverty and hunger. As a short-term policies poor may be provided shelter, food and resources. Where as in long-term good governance, better and timely management of resources, creation of job and education for all can make difference. Besides this, training and imparting skills to labor will cut poverty. On the whole, curbing corruption and bringing peace are better tools for elimination of poverty. However there is great need of political will to address all such issues like poverty. Collective and joint efforts will bring prosperity and peace in the world.